Learn the unique story of our winery as you take in the sweeping views of the vineyard and valley. Enjoy food and wine pairings in a relaxing setting with cozy fireplaces, an expansive patio, spacious courtyard and a 65-foot lookout tower. Take a private tour! Open daily from 11 am - 6 pm and Fridays and Saturdays until 8 pm. Flights waived with the purchase of two bottles. Wine Club Members and Owners receive a complimentary tasting. Our Daily Flight showcases a mix of white and red wines and our Reserve Flight highlights small-lot bottlings, like our Griffin Creek wines and exclusive Pinots. Our food pairings menu has been thoughtfully prepared by award-winning Winery Chef DJ MacIntyre and features fresh local ingredients to enjoy with our classic Oregon wines. Served daily in our Estate Tasting Room from 11 am to 6 pm and until 7:30 pm on Fridays. Kindly, we do not allow outside food or beverages inside our Estate Tasting Room or Patio Decks where we serve our daily menu. Picnics with outside foods may be enjoyed outdoors on the wooden Pinot Decks and Pinot Lawn. Please join us for hors d'oeuvres and a three-course dinner featuring fresh local ingredients, thoughtfully paired with our classic Oregon wines. Each month will feature a theme coinciding with the food and wine pairings. 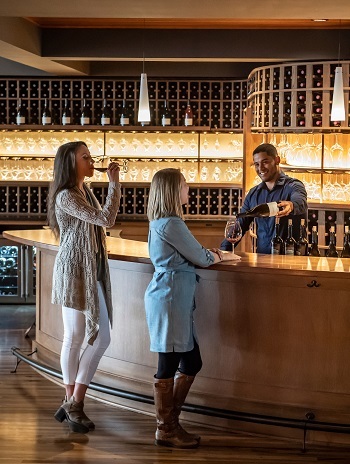 Led by our Winery Chef and a knowledgeable Winery Ambassador, you'll hear stories on the history of Oregon wine and tips for enhancing your meals with wine. Cost can vary depending on the theme; visit our event page for more details. Each guest will receive a $10 wine credit to use that evening. Reservations are required. Visit us online or call 1-800-344-9463 to reserve your seat. Join us daily at 2 pm for a complimentary general tour of Willamette Valley Vineyards. Tours meet in our Estate Tasting Room near the front. Please plan for this experience to take approximately 30 minutes. Take a private tour and tasting led by a Winery Ambassador. This detailed tour of our winery is 1 - 1.5 hours long and will give your party a behind-the-scenes look at the winery, complete with stories and exclusive wine offerings. Cost is $20 per person and includes private tour, tasting and cheese pairings. Available by appointment only and offered at 11 am, 1 pm, 2 pm and 3 pm. Wine Club Members and Owners receive complimentary tours for themselves and up to 8 guests. Email info@wvv.com or call 1-800-344-9463 to book your reservation. A credit card is required to hold your reservation. There is a $25 cancellation fee for tours not cancelled within a 48-hour notice. Our Club Room is open to all Owners, Wine Club members and their guests to enjoy stunning vineyard views, a cozy fireplace and private patio access. Prior to the 2014 remodel, the Club Room served as the Estate Tasting Room until it was converted to the elegant space it is today. The Club Room has dedicated staffing on Fridays, Saturdays and Sundays. Groups of 10 - 20 people are encouraged to contact the Hospitality Department for small party reservations to ensure a quality experience with one of our Tasting Room Associates/Ambassadors. Please call 1-800-344-9463 to make your arrangements. A credit card is required to hold your reservation. For groups larger than 20, please visit our Private Events page or contact our Hospitality Department to book your event. We love dogs! Your pet is welcome to join us during your visit and are allowed on the Pinot Decks and Pinot Lawn. We have bag stations and water dishes situated throughout the lawns for your convenience. Because we have a full kitchen, we do ask that you do not bring them into the Tasting Room, unless ADA registered as a service animal. During warmer months, please do not leave your dog in your car.